Perfect for kids on the GO! Small enough to fit into almost any backpack or bag, the NIrV Backpack Bible is ideal for home, school, or church use. It uses the New International Reader's Version (NIrV), an easy-to-read Bible translation based on the bestselling New International Version (NIV). Serving as a stepping stone to the NIV, the NIrV accurately conveys biblical meaning in a way that kids understand and parents trust. This compact and portable NIrV Backpack Bible is perfect for kids ages 6 to 10 and includes the easy-to-read New International Reader's Version (NIrV) translation in an attractive and durable Italian Duo-Tone binding. 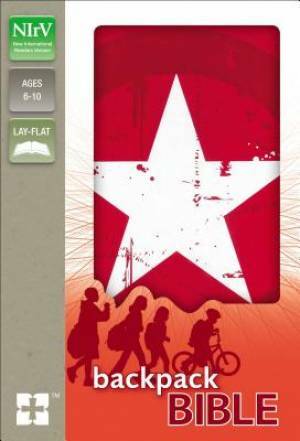 NIrV, Backpack Bible, Red/White by Zondervan was published by Zonderkidz in July 2014 and is our 60275th best seller. The ISBN for NIrV, Backpack Bible, Red/White is 9780310744863. Be the first to review NIrV, Backpack Bible, Red/White! Got a question? No problem! Just click here to ask us about NIrV, Backpack Bible, Red/White.